Imagine seeing the beautiful Southern Pacific GS-4 pulling a string of those magnificently painted passenger cars along the California coast. Then add the sight of a Cab Forward applying her muscle for the climb over the steep grade between San Luis Obispo and Santa Margarita. Any railfan's delight. The Coast Daylight was two separate trains, #98 and #99. Each operated as a unit train and cars were not normally added or removed, but for extra capacity, chair car pairs were added. The two trains left San Francisco and Los Angeles at 8am, passed each other in the neighborhood of San Luis Obispo, and arrived around 6pm. Often called the most beautiful train in the world, BLI has modeled both consists and will deliver them in monthly intervals. 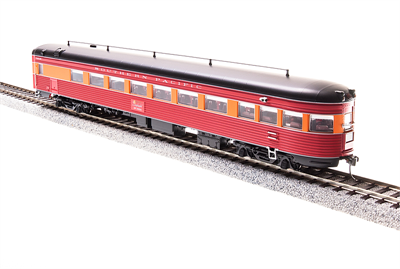 ****SP DCC operators, Broadway Limited Imports is pleased to provide an SP Coast Daylight Observation Car in HO Scale with extensive DCC controlled lighting! This new observation car is equipped with a dual-mode DC/DCC light decoder designed and built by Broadway Limited Imports. The DCC Light Board has five separate light outputs controlling the car interior, rear drumhead, rear marker lights, side marker lights, and the rear Mars light.